I loved my Senior year Prom dress! It was red statin, strapless sweetheart neckline, with a front slit. It fit me perfectly and looked amazing. After prom, I kept it in my closet even though I “knew” I would never wear it again. Boy, was I wrong! My freshman year at University I was invited to Homecoming Fraternity Formal with friends. I needed a fabulous formal gown, but I was a broke college student and did not have any extra money for a formal dress. I wore my beautiful red prom dress to Homecoming. I already had the shoes and accessories to match. No one from my High School was there, so it was new to everyone else. I spent zero money on a fun night out with friends. My prom dress became a two-fer (two wearings for the price of one) dress at that Homecoming! Still not able to part with my gorgeous gown, back to my closet it went. Then, Christmas rolled around and I was invited to a couple Holiday parties. I was able to splurge on a short faux fur jacket and then wore my festive red dress to the fanciest party. I accessorized my dress with a pair of black heels and black bag that I already owned, which gave me a completely different outfit. Classic styles have a long shelf life. Avoid super trendy colors or cuts that will prevent ever being able to wear the dress again. Pay attention to the fabric. My Senior prom dress was a light weight satin and could be worn year round, just add a tights or pantyhose and a jacket for winter. A dress from my Junior year was velvet and I only wore it once (as a holiday formal) because it was so hot. High quality garment that will still look good after multiple times being washed/dry cleaned. Mix and match shoes, purse, jewelry, hair style, jackets/wraps, and other accessories to give you a unique look for the same dress. This will keep you loving your gown and feel like a new outfit each time. Avoid messy foods that will stain or damage your dress. Apply cold water immediately on spots, know these tips to get the stains out, and wash or professionally dry clean after each wearing. Immediately after Prom, or a couple years later, I could have sold my prom dress. I was able to save more money wearing that dress a few more times, than I could have sold it for. During High School and college, I loaned a couple of my dresses to friends attending a function at a different school. We were frugal and looked great doing it! 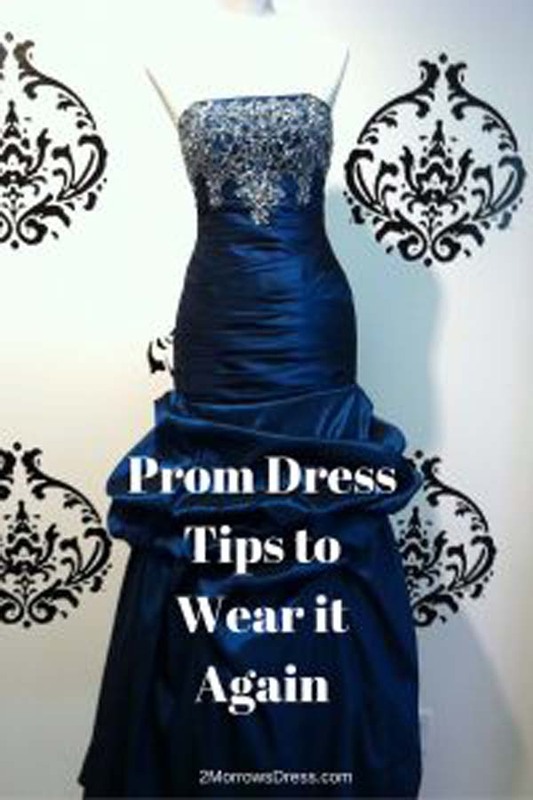 Another option for your Prom or formal dress is to shorten the skirt. A simple hem can completely change your floor length to high-low, tea-length, or above the knee short dress. Wear a crop top over your dress for a fun high waist skirt look. Experiment with your dress, and you may find several other outfit options to Wear it Again! A former customer loved her prom dress so much, she was looking for suggestions to wear it again for her wedding! Your Prom dress can be worn multiple times, upcycled into a different garment, used as part of your Halloween costume, or loaned/sold to someone else to enjoy. Whatever you decide, your gown does not have to be a wear it once item.